The idea of making a difference began with a simple truth: goods and services that can be found in a large city should be accessible and reasonable right here in the town we grew up in and either stayed in or came back to raise our kids in. It started with the hope of making a difference to working men, women and families in our community, creating jobs and providing quality goods at a price we can be proud of. Starting out as a video store in 2009, we quickly began to fulfill our desire to offer more to the community than quality entertainment. From the beginning, we began to increase the number and quality of documentary, foreign and independent titles available for both entertainment and education. A natural progression was to begin offering office services and supplies, including email, fax, phone cards, photocopying and notarial services. Owning and operating a farm, we began distributing our locally grown produce from the store front that first growing season and have continued to do so ever since. Because some things just don't grow well on the Oregon coast or have a very limited growing season, we started seeking those items from a local (Eugene) organic produce supplier. We still offer produce in its natural season, but with a greater variety than our farm and adjacent farms up the Yachats River can provide. We also began to carry high quality, heirloom, non-GMO garden seeds from Baker Creek, Thyme Garden and Peaceful Valley Farm Supply. These seeds are selected for our growing area and come from the suppliers our families have used for many years. 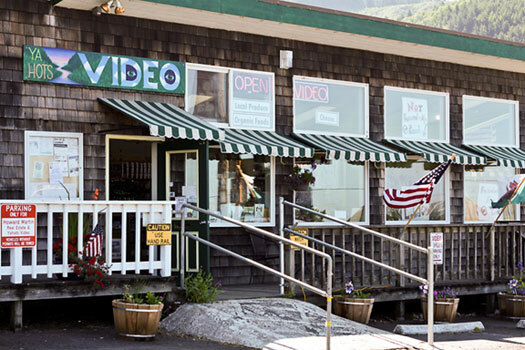 Derek & Vicky bought the local Yachats video store in 2009 and reinvented the image by blending both the old and the new. Playing on an old time Yachats slogan, "When ya hots, Ya-Hots! ", they renamed the store to reflect a hats off to what had been and a view to what could be. Commissioning local artist, Qahira Lynn, the iconic business signs were born. With a history of blending the old and the new, Derek is a new resident of Yachats, moving to the area in 1991. Upon coming here from Wales, UK, Derek has found that there is a rather sizable Welsh population in Yachats and thoroughly enjoys the camaraderie. Derek's background in technical teaching, customer service and backyard farming bring a wealth of knowledge to the store. With many years of traveling abroad, Derek has experienced many cultures and cuisines and provides thoughtful insight on the films and goods available. Vicky is a long time resident, born and raised right here in Yachats. After moving away for school and coming back to the family farm, Vicky decided that while the cultural diversity of larger areas was good, small town rural life was better. Growing up growing things, continuing to farm the land she was raised on was a logical conclusion. 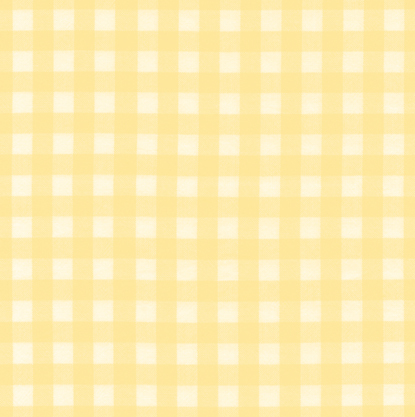 Vicky has a solid knowledge of local area farming and its perks and limitations along with a knowledge that natural is better and using chemicals and poisons destroys both crop and ground. Experiencing both the front and back of the house in upscale establishments gave her a good appreciation of what can be done in a kitchen and a how to get there. 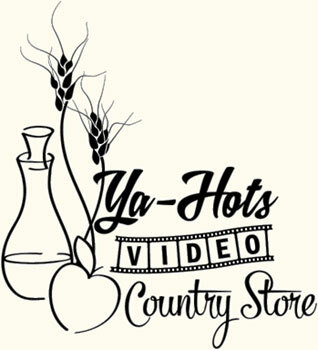 One of the limitations of living in a small town was the dearth of quality herbs, spices and ingredients for international cuisine, so Ya-Hots Video Country Store became an extension of her pantry and she has been able to share these finds and knowledge with our local community to enhance their culinary experience and experiments.